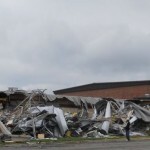 Structural Demolition services offered by Rapid Recovery Service Inc. Fraser MI. Rapid will cleanup for both residential and commercial structures. Our demolition services are safe and efficient and include full site cleanup, removal of debris and contaminated material from the structure. The destruction, dismantlement, and decontamination of structures demand the right combination of experience, technology, and training. Rapid Recovery Service team members have extensive training and expertise in demolition. demolition includes dismantling and decontamination of all types of buildings. We specialize in the structural demolition of complex and intricate structures. Typically from extensive fire, mold or water damage. Rapid has experience in facilities contaminated with asbestos, acids, caustics, heavy metals (such as lead, arsenic, chrome, etc.) and radioactive materials as well. Rapid Recovery Service continually invests in technology and maintains an extensive fleet of equipment. We have the ability to dismantle a structure whether it is a business or home structure, in its entirety or perform selective dismantlement of a portion of the structure. We are capable of handling the most complex demolition projects. Rapid Recovery Service also offers Content Restoration. We specialize in complete pack out and restoration of all contents. We want to make sure that you not only get the outside of your house restored but the items in it as well. We store your belongings in a secure, climate-controlled environment.